For me the words conservation and restoration bring up a few different emotions. The first emotion that rises to the surface is a sense of happiness and hopefulness that stems from the idea that there are sets of people working to better the ecosystems around us. The problem arises when I try to think more deeply about the impacts of conservation and restoration. While both of these acts have the direct impact of bettering or improving an ecosystem, people rarely think about the impacts on the people that live in that space now and the people who have occupied that land since time immemorial. The negative effects of restoration and conservation can and do outweigh the positives many of the times. By focusing on preserving land, taking back land from people to create ecological systems, or altering ecological systems to best meet “perfection” in the eyes of the current system of power, conservation not only directly displaces people, but also indirectly displaces populations by destroying sources of food, medicine, or education. The people that these projects tend to displace are the communities that hold less power and privilege in our settler-colonist society. In the case of North America and the Salish Sea in particular these communities are people of color and indigenous groups. These are the communities that are displaced because the people in power are generally white settler colonists who are feeding their projects through a colonial system. This project as explained so nicely by Elise is a rare example of a project that breaks through this system. It works to not only restore a vital ecosystem but also to restore and return land to people that have been displaced by colonization. This project is based on the reconstruction of clam gardens which are classified as culturally significant food sources. These clam gardens that the Cowichan and Coast Salish groups constructed and managed for hundreds, if not thousands, of years were stolen and neglected during colonization. Having them returned to their people is a huge step in the continuing act that is reconciliation. The importance of Russell Island being inside the Gulf Islands National Preserve lies in the fact that the designation of preserve allows it to be co-managed by First Nations. This allows these First Nation groups to negotiate for more harvesting rights and to retake their land. The reconstruction and returning of these clam gardens is only a small step in the long process of reconciliation and return of territory. There is a long way to go until people fully understand the impacts of conservation and restoration projects but there are people and places that show that this understanding can be reached. As we travel on this ship that is Redfish we have spoken to so many amazing people that are doing the work needed to allow the greater public to understand these disparities. We will continue to meet and interact with even more amazing and inspirational people over the next few weeks. My hope is that this essay and others that cover this topic will help you all understand the work that people are doing and the change we hope to make in our futures. 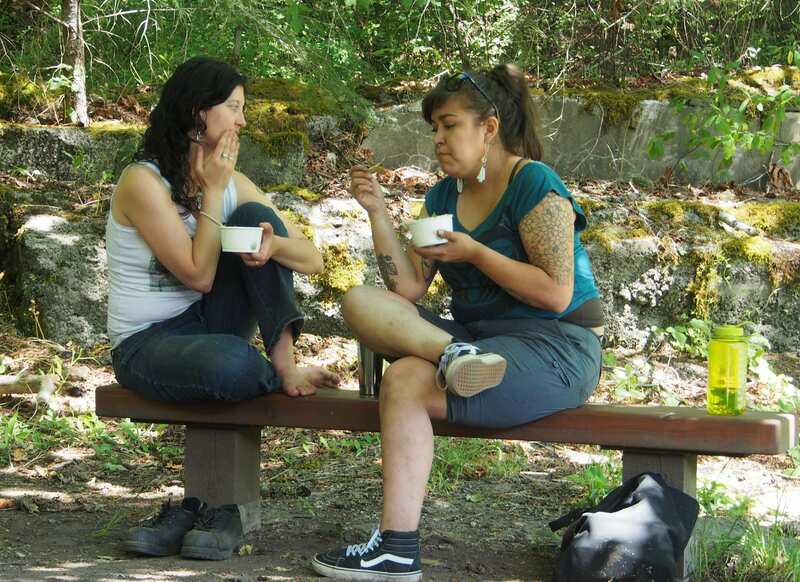 Judith Lyn Arney and PEPAḴIYE Ashley Cooper share a meal of BBQ clams at SṈIDȻEȽ (pronounced ‘sneed-kwith’), a central village site for the Saanich Peoples and a place of traditional clam harvesting. The First Two Weeks: Redfish School of Change 2018!